Potato chips with bell pepper flavor. ATTENTION: We do ship all of our merchandise via airmail, which means that your order is subject to fluctuating altitudes during transit. The amount of air inside a bag of chips is always fixed. If a bag of chips is taken to a higher elevation the air inside of the bag will swell against the reduced atmospheric pressure. This may results in bursting at the seams. Please order chips at your own discretion. 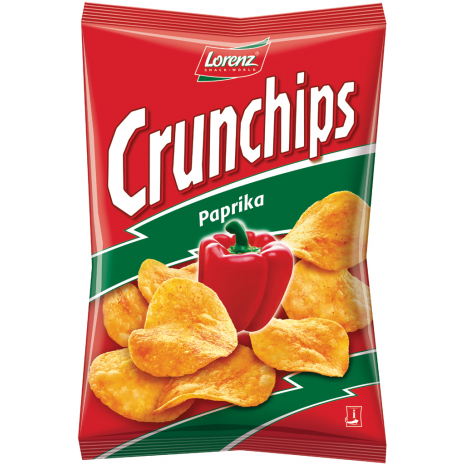 Crunchips Paprika is one of the most popular variety – the classic with the unbeatable crunch and the taste of sun-ripened bell peppers. 175g / 6.17 oz NET. WT. Potatoes, sunflower oil, salt, paprika powder, onion powder, SWEET WHEY POWDER, sugar, CHEESE POWDER, tomato powder, pepper, flavoring, smoke flavor, yeast extract powder, color: paprika extract. Kartoffeln, Sonnenblumenöl, Salz, Paprikapulver, Zwiebelpulver, SÜSSMOLKENPULVER, Zucker, KÄSEPULVER, Tomatenpulver, Pfeffer, Aroma, Raucharoma, Hefeextraktpulver, Farbstoff: Paprikaextrakt.